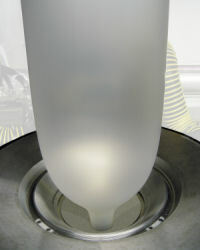 Macro Engineering & Technology Inc. has developed a series of double-bubble lines for barrier shrink film applications. The lines, which Macro is marketing under the name DXL Series, required years of investment in R&D before being made available. The primary product for the line is 5- or 7-layer tubing for shrink bags used as food packaging for cheeses and fresh or smoked meats. The primary barrier material in the film can be PVdC, EVOH or Nylon. Tubing processed on the line can have a width between 200-600 mm and a film gauge between 40-80 microns. The shrink bag film offers excellent barrier to water, oxygen and aromas, shrinkage (MD/TD) of 40-60%, superior puncture resistance, and is heat sealable and printable. As with other Macro lines, the DXL line is offered as a total processing solution. Macro provides a complete technology transfer package in which Macro not only supplies the machinery, but also provides the processor with the film structure including resin specifications, and training on how to run the line. Macro already has several of their DXL lines in operation worldwide, including 5 installations in 2008. For more information on Macro's DXL Double-Bubble Film Lines click here.